Get Berry Ready for Blueberry Cheesecake Day! — and it’s a reason to celebrate! This special day has been near and dear to our hearts ever since our delectable Blueberry Cheesecake fragrance debuted in our Spring/Summer 2007 Catalog. 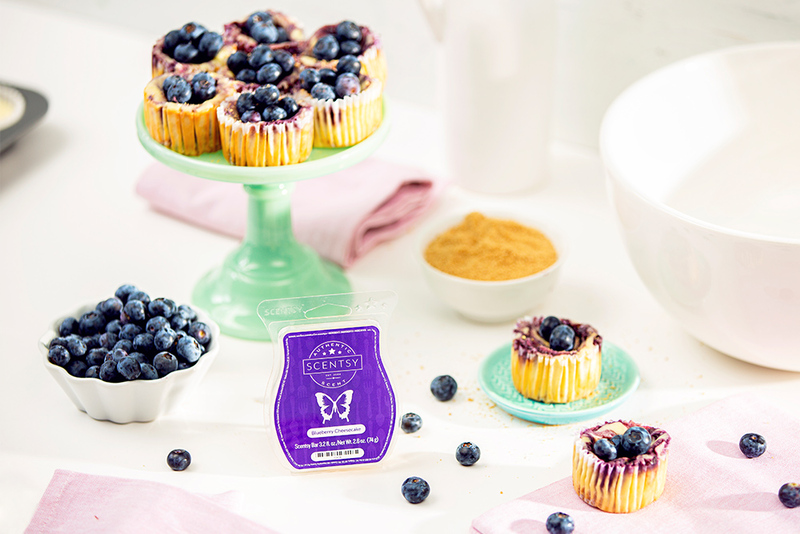 Enjoy yummy Blueberry Cheesecake the Scentsy way! Choose from bars, Room Sprays, Scent Circles, and more. 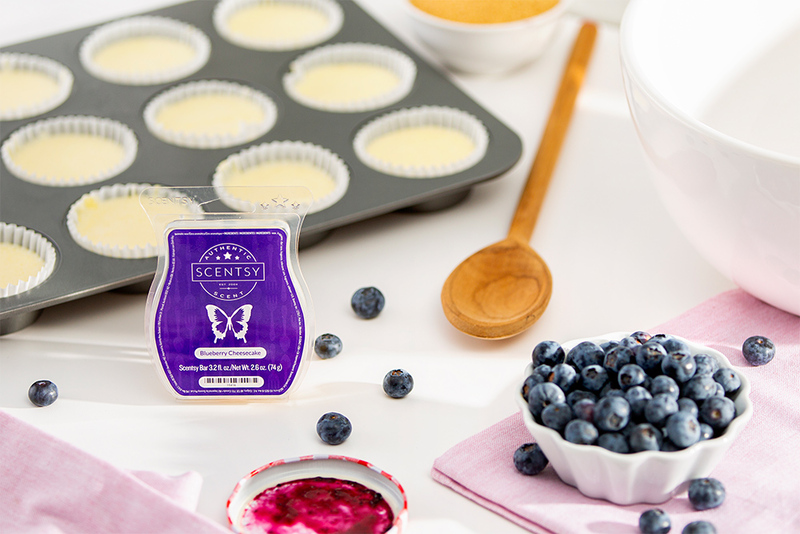 Just pick your faves, contact your Scentsy Consultant to order, and prepare yourself for blueberry bliss! If you don’t have a Consultant, you can find one here. Eat blueberry cheesecake! If cheesecake’s not your thing, enjoy some tasty dishes inspired by this popular dessert. We’ve included a few delicious options for you to choose from. This creamy, rich dessert made with soft cheese or cream cheese atop a graham cracker crust can be served with blueberries baked into the cheesecake (like this recipe), or with blueberry sauce served on top (like this one). Short on time? Any of these recipes are quick, easy and still deliver that delicious blueberry cheesecake kick you’re looking for! Blueberry Cheesecake Cookies: Want to give the kids a special treat in their lunch bags (and maybe yours, too)? This recipe takes a premade blueberry muffin mix and spruces it up, blueberry cheesecake style! Blueberry Cheesecake Streusel Muffins: Start National Blueberry Cheesecake Day off right with a lip-smacking streusel muffin for breakfast. Light and tasty, these are a clever twist on the classic blueberry muffin! Mini Blueberry Cheesecakes: Just as delicious as the real thing, and they only take 20 minutes to bake. The hard part will be waiting for them to cool! Do you have a favorite blueberry cheesecake recipe? Share it with us in the comment section! Separator image Posted in Food & Recipes, Our Products. Summers are made for your Scentsy side job! Love love love this blog ! We’re happy you’re loving it! ? Hi Nancy, Feel free to use our Consultant locator to get in touch with Consultants near you! Go to goo.gl/gopkUj and enter your address in the top left corner of the page to view a list of local Consultants you can reach out to for your Scentsy needs! ?